This is definitely a helpful feature to have automatically built into the vSphere UI and the default expiry actually depends on the type of user logging into the system. This last part is sometimes confusing as folks mix up the default Single Sign-On User Expiry with the Active Directory user expiry which is completely different. For SSO Domain (vsphere.local by default) users, the password expiry AND notification by default is 90 days. This can be configured in the vSphere Web Client under Administration->Single Sign-On->Configuration->Password Policy as shown in the screenshot below. For those wanting to automate this configuration, there is currently not an SSO Admin API, but there are some options, have a look at this blog post here. If you are logging in as an Active Directory user, the password expiry notification by default is 30 days but the actual password expiry will obviously depend on your Active Directory system. If you want to change the expiry notification in case your expiry is not 30 days or you wish to notify sooner or later, this is actually controlled by the vSphere Web and H5 Client. This particular question and its variations have been raised quite a bit lately by our field and customers. For me, this was an opportunity to see if we can provide some additional clarification and help explain some of the nuances that may have been causing some of the confusion around the supported maximums for both vCenter Server and the Platform Services Controller (PSC). In the vSphere 6.5 Configuration Maximum, there are three specific maximums that helps us answer our question on the maximum number of vCenter Servers per vCenter Single Sign-On (SSO) Domain. I will go through each of the maximums and provide some additional context that will help us derive the answer to our question. The first is the "Linked vCenter Servers" which defines the maximum number of vCenter Servers that can be supported in an Enhanced Linked Mode (ELM) configuration. What is interesting about this particular maximum is that it actually answers the majority of our question. By definition, an ELM consists of a single SSO Domain. This then means that you can only have a maximum of 10 vCenter Servers per SSO Domain. The second is the "Maximum PSCs per vSphere Domain" which defines the maximum number of PSC's that can be part of a single SSO Domain, pretty straight forward. The third is the "Maximum PSCs per site behind a load balancer" which just adds an additional constraint when using a load balancer with your PSCs. In the last couple of months, I have noticed an increase in customer interests in using the Cross vCenter vMotion (xVC-vMotion) capability that was introduced back in vSphere 6.0. In my opinion, I still think this is probably one of the coolest features of that release. There is no longer the limitation of restricting your Virtual Machine mobility from within a single vCenter Server, but you can now live migrate a running VM across different vCenter Servers. The primary method to start a xVC-vMotion is by using the vSphere Web Client which requires your vCenter Servers Servers to be part of the same SSO Domain and will automatically enable the new Enhanced Linked Mode (ELM) feature. 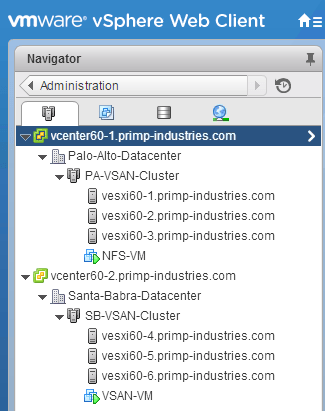 ELM allows you to easily manage and view all of your vCenter Servers from within the vSphere Web Client as shown in the example screenshot below. However, the vSphere Web Client is not the only way to start a xVC-vMotion, you can also automate it through the use of the vSphere API. In fact, there is even an "Extended" capability of xVC-vMotion that is not very well known which I have written about here which allows to live migrate a running VM across two different vCenter Servers that are NOT part of the same SSO Domain. This Extended xVC-vMotion (unofficially I am calling it ExVC-vMotion) is only available when using the vSphere API as the vSphere Web Client is unable to display vCenter Servers that are part of another SSO Domain. Below is a quick diagram to help illustrate the point in which VM1 can be seamlessly migrated between different vCenter Servers from within the same SSO Domain as well as between different vCenter Servers that are not part of the same SSO Domain. Note: For additional details and requirements for Cross vCenter vMotion, please have a look at this VMware KB 210695 and this blog post here for more information. UPDATE (06/15/17) - I have added a few minor enhancements to the script to support migrating a VM given a vSphere Resource Pool which enables the ability to migrate to and from VMware's upcoming VMware Cloud on AWS (VMC). There is also an additional UppercaseUUID parameter which seems to be required for some xVC-vMotions where the vCenter Server's InstanceUUID must be provided as all upper case or the operation will fail. I have still not identified why this is needed for some migrations, but for now there is a nice flag that can be used to enable this if you are hitting this problem. UPDATE (04/08/17) - In vSphere 6.0 Update 2, there is a known limitation which prevents a VM that has multiple VMDKs stored across different datastores to be xVC-vMotion (compute only) using the vSphere Web Client. This limitation no longer exists in vSphere 6.0 Update 3 but does require customers to upgrade. If you need to perform a compute-only xVC-vMotion where the VM has multiple VMDKs across different datastores, the vSphere APIs does not have this limitation and you do not necessary need to upgrade to be able to perform this operation. Huge thanks to Askar Kopayev who discovered this and also submitted an enhancement to my xMove-VM PowerCLI script to support this functionality. Given the amount of interest recently and some of the feedback on my original ExVC-vMotion script which I had written about here, I figured it was time to refactor my code so that it could easily support both ExVC-vMotion as well as standard xVC-vMotion. In addition, I have also added support for migrating to and from a Distributed Virtual Switch (VDS), where as previously the example only supported Virtual Standard Switch (VSS). Lastly, the script now also supports migrating a VM that is configured with multiple vNICs. Note: When changing the type of vSphere Switch, the following combinations will are supported by the script as well as using the vSphere Web Client: VDS to VDS, VSS to VSS and VSS to VDS. VDS to VSS is not supported using the UI or API and neither are 3rd party switches supported. Are Affinity/Anti-Affinity rules preserved during Cross vCenter vMotion (xVC-vMotion)? 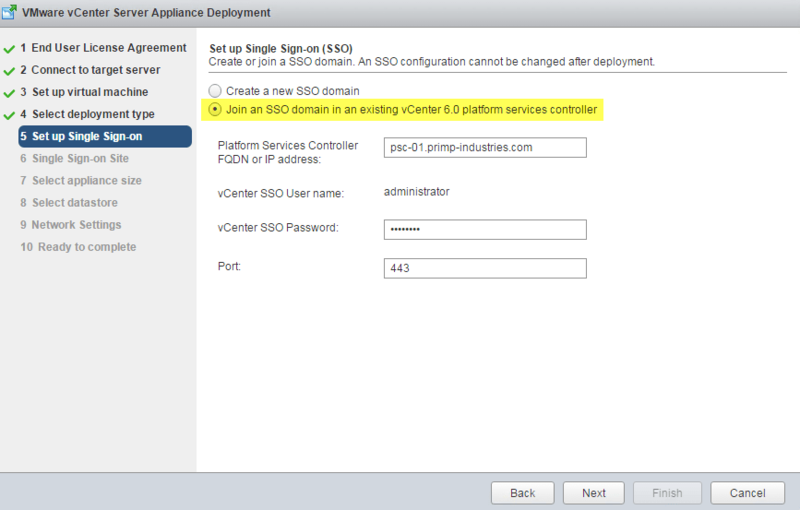 How to automatically repoint & failover VCSA to another replicated Platform Services Controller (PSC)? For those of you who read my previous article (if you have not read it, please do so before proceeding forward), at the very end I showed off a screenshot of a script that I had created for the vCenter Server Appliance (VCSA) which automatically monitors the health of the primary Platform Services Controller (PSC) it is connected to and in the event of a failure, it would automatically repoint and failover to another healthy PSC. 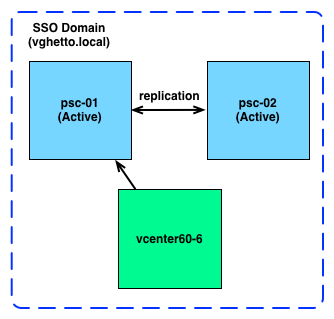 The way it accomplishes this is by first deploying two externally replicated PSC's and then associating the VCSA with just the first PSC which we will call our primary/preferred PSC node. Both PSC's are in an Active/Active configuration using a multi-master replication and any changes made in SSO on psc-01 (as shown in the diagram) will automatically be replicated to psc-02. From a vCenter Server's point of view, it is only get requests serviced by a single PSC, which is psc-01 as shown in the diagram above. Within the VCSA, there is a script which runs a cronjob that will periodically check psc-01's connectivity by performing a simple GET operation on the /websso endpoint. If it is unable to connect, the script will retry for a certain number of times before declaring that the primary/preferred PSC node is no longer available. At this point, the script will automatically re-point the VCSA to the secondary PSC and in a couple of minutes, any users who might have tried to login to the vSphere Web Client will be able login and this happens transparently behind the scenes without any manual interaction. For users that have already logged in to vCenter Server, those sessions will continue to work unless they have timed out, in which case you would need to log back in. The script is configurable in terms of the number of times to check the PSC for connectivity as well as the amount of time to wait in between each check. In addition, if you have an SMTP server configured on the vCenter Server, you can also specify an email address which the script can send a notification after the failover and alert administrators to the failed PSC node. Although this example is specific to the VCSA, a similar script could be developed on a Windows platform using the same core foundation. Disclaimer: This script is not officially supported by VMware, it is intended as an example of what can be done with the cmsso-util utility. Use at your own risk. Step 1 - Deploy two External PSCs that are replicated with each other. Ensure you select the "Join an SSO domain in an existing vCenter 6.0 platform services controller" option to setup replication and ensure you are joining the same SSO Site. Step 2 - Deploy your VCSA and when asked to specify the PSC to connect to, specify the primary/preferred PSC node you had deployed earlier. In my example, this would be psc-01 as seen in the screenshot below. Step 3 - Download the checkPSCHealth.sh script which can be found here. Step 5 - Next, you will need to edit the script and adjust the following variables listed below. They should all be self explanatory and if you do not have an SMTP server setup, you can leave the EMAIL_ADDRESS variable blank. Copy the following snippet as shown below into the crontab of the root user account. The first half just covers all the default paths and the expected libraries to perform the operation. I found that without having these paths, you will run into issues calling into the cmsso-util and I figured it was easier to take all the VMware paths from running the env command and just making it available. The very last last line is actually what setups the scheduling and in the example below, it will automatically run the script every 5 minutes. You can setup even more complex rules on how to run the script, for more info, take a look here. Step 7 - Finally, you will probably want to test the script to ensure it is doing what you expect. The easiest way to do this is by disconnecting the vNIC on psc-01 and depending on how you have configured the script, in a short amount of time it should automatically start the failover. All operations are automatically logged to the system logs which you can find under /var/log/messages.log and I have also tagged the log entries with a prefix of vGhetto-PSC-HEALTH-CHECK, so you can easily filter out those message in Syslog as seen in the screenshot below. If a failover occurs, the script will also log additional output to /root/psc-failover.log which can be used to troubleshoot in the case a failover was attempted but failed. To ensure that the script does not try to failover again, it creates an empty file under /root/ran-psc-failover which the script checks at the beginning before proceeding. Once you have verified the script is doing what you expect, you will probably want to manually fail back the VCSA to the original PSC node and then remove the /root/ran-psc-failover file else the script will not run when it is schedule to. After publishing my last article around the topic of Automating SSO Admin configurations using some simple LDAP commands which is applicable for both vSphere 5.5 and 6.0. It was pointed out to me by my buddy G. Blair Fritz who works over in our GSS Organization that another handy operation to share with customers is the ability to easily and quickly change an SSO Administrator password across multiple Platform Services Controllers (PSC). This is especially important for customers who have a password rotation policy set fourth by their Security team which most Enterprise customers have and are require to update their admin passwords every N-number of days. The really nice thing about this is that you can quickly change the password for your SSO Administrators across multiple Platform Services Controller and across multiple SSO Domains with a couple slight modifications to the command. How cool is that!? Thanks to Blair for sharing this awesome tidbit!